The U.S. Navy has used marine mammals, or cetaceans, for military purposes since the late 1950s. Atlantic bottle-nose dolphins, Pacific white-sided dolphins, and California sea lions are currently used in military operations, and training has also been conducted with belugas, killer whales, and pilot whales. Because dolphins have superior sonar that is currently unmatched by technology and sea lions have an excellent sense of directional hearing along with sensitive low light vision, these marine mammals are extremely well suited for search and rescue and swimmer defense operations. History of marine mammals in the military. In the 1959, the United States Navy established a marine mammal program at Marineland near Los Angeles, California. Naval researchers were initially interested in studying the hydrodynamics of dolphin swimming in order to better understand boat and submarine design. Dolphins can attain high swimming speeds and can maintain those speeds for long periods of time. Marine scientists found that the dolphin's keen sense of echolocation was ideal for finding lost equipment on the sea floor and for locating enemy mines and torpedoes. In addition, dolphins are extremely intelligent and trainable. One of the first dolphins involved with the program was a Pacific white-sided dolphin named Notty. In 1962, the marine mammal program was moved to Point Magu, California. Three years later, the Point Magu program established an underwater laboratory called Sea Lab II, which was 200 feet below the surface of the ocean. There a dolphin named Tuffy was trained to work with divers in experiments designed to see if the use of dolphins might help circumvent the dangers to humans inherent in deepwater diving. Tuffy's work also showed that dolphins could easily be trained to work without tethers in the open ocean. The successes of Sea Lab II led to the establishment of the Advanced Marine Biological Systems (AMBS) program, which currently funds military marine mammal programs. In 1967, the marine mammal program was moved from Point Magu to Point Loma in San Diego, and a separate marine mammal training facility was opened in the Marine Corps Air Station in Kaneohe Bay, Hawaii. Both of these programs investigated the physiology and behavior of cetaceans, developed techniques for medical diagnosis and treatment, and worked to understand the communicative noises made by dolphins. In Hawaii, research was also conducted on the reproductive physiology of dolphins. In addition, investigators studied the cost and safety benefits of using marine mammals. In 1993, the facility at Kaneohe Bay was closed and most of the marine mammals were relocated to Point Loma. During the Cold War, the Soviet Union also developed a marine mammal program. Dolphins were trained to search for underwater explosives and were used to guard coastal waters from attack. After the dissolution of the Soviet Union, the dolphins became part of the Ukrainian navy. In 1997, the Ukrainian navy donated the dolphins to a program that uses the animals in therapy for disabled children. Training and maintenance. The U.S. Navy maintains the marine mammals in their training and operational programs in open-mesh enclosures in bays and harbors in the ocean. This allows the dolphins to experience their natural echolocation and social environments. During training, the animals are untethered in the open ocean. All operational training is based on positive reinforcement, using food for rewards. Animals are not punished for failure to perform tasks by withholding food. Survival rates for the marine mammals maintained by the navy are between 95 and 100 percent. During thousands of training exercises in the open ocean over a 30-year period, only seven animals have not returned to their enclosures. Several groups have criticized the navy's marine mammal program, citing undue stress to and mistreatment of animals used for military purposes. In the 1980s, the Progressive Animal Welfare Society (PAWS) successfully sued the navy to halt its marine mammal program in Washington State. However, a committee appointed by the president reviewed the program in 1988 and 1990 and gave satisfactory or outstanding ratings to all aspects of the program. The National Marine Fisheries (NMFs) reported that survival rates of dolphins in the program were the highest of all organizations maintaining large numbers of cetaceans. U.S. Navy Sergeant Andrew Garrett with K-Dog, a bottle-nose dolphin who was being trained for mine-clearing operations in support of Operation Iraqi Freedom, 2003. Marine Mammal Systems. The navy currently operates four Marine Mammal Systems (MMS) as part of its fleet. An operational MMS consists of four to eight marine mammals, an officer-in-charge, and several enlisted personnel. Before a MMS is approved for operations, it undergoes the same type of rigorous testing as other operational naval systems. It must prove effective and reliable as well as cost effective. Marine Mammal Systems are highly transportable and can be airlifted to any operational site. SPAWAR (Space and Naval Systems Center, San Diego) supports a deployed MMS, replenishing animals and providing training, documentation, and personnel. The four operational MMS include both dolphin and sea lion systems. Mk4 and Mk7 are dolphin mine detection and location systems. They can be deployed from a ship in order to search for and mark mines that are tethered to the ocean floor. Mk5 is a sea lion mine detection system, which can detect mines to a depth of 1000 feet. The sea lions are trained to attach a grabber device to a mine so that naval personnel can recover it. Mk6 is a dolphin swimmer defense system. Dolphins are trained to locate an intruder trying to come ashore via the ocean. Although dolphins and sea lions are the only marine mammals currently used in military operations, pilot whales, killer whales and beluga whales have also been involved with object search and recovery. These cetaceans have the ability to dive to extreme depths, much beyond those attainable by human divers. A project called Deep Ops studied the abilities of pilot whales and killer whales to recover objects from deep depths. The pilot whale was able to successfully recover a dummy torpedo from a depth of 1,654 feet using a gas-inflated recovery device. The killer whales recovered objects from 500 and 850 feet. Belugas were able to dive to 2,100 feet and were able to recover dummy torpedoes from 1,300 feet. Marine mammal deployments. 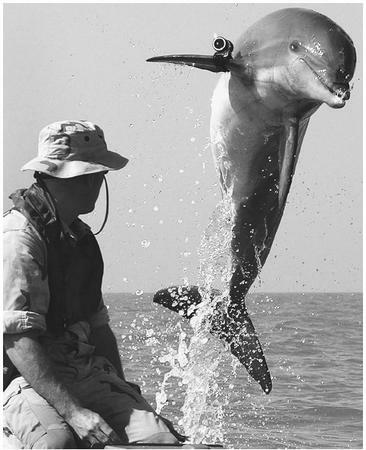 The military first used the dolphin swimmer detection system in the Vietnam War in 1970. This successful operation, which involved dolphins patrolling the waters near warships, brought an end to underwater sabotage in Cam Ranh Bay. In 1987 and 1988, the navy used dolphins for mine surveillance in waters off Bahrain in the Persian Gulf. The animals patrolled the waters for mines and escorted Kuwaiti tankers through areas where the Iranian military was attempting to disrupt oil shipments. Marine mammal systems were in operation during the Republican Party Convention in 1996. Both dolphin mine detection and location systems and sea lion swimmer defense systems were used to protect the waters off of San Diego from terrorist attack. After British forces took control of the southern Iraq port city of Umm Qasr in 2003, the U.S. Navy brought in Atlantic bottlenose dolphins to search the bay for mines and mark them for destruction by human divers. Sea lions were also deployed around ships in Bahrain to detect and defend against armed swimmers. These sea lions were trained to attach floater devices to intruders so that security officers could apprehend them. Bulletin of Atomic Scientists. "U.S., Ukraine at cross porpoises." < http://www.bullatomsci.org/issues/1997/nd97/nd97bulletins.html > (April 22, 2003). Dolphins of War. < http://www.angelfire.com/nj4/navydolphins/ > (April 22, 2003). MSNBC News. "Dolphins go to front lines in Iraq war." < http://www.msnbc.com/news/890520.asp > (March 25, 2003). Public Broadcasting System. "The Story of Navy Dolphins." < http://www.pbs.org/wgbh/pages/frontline/shows/whales/etc/navycron.html > (April 22, 2003). U.S. Navy Marine Mammal Program. < http://www.spawar.navy.mil/sandiego/technology/mammals/ > (April 22, 2003).